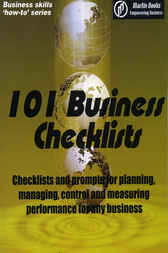 This book was originally prepared in response to many requests from both bookshops and people in commerce and industry for an easy to use book, “With lots of checklists that we can use constantly to measure performance as well use as prompts for planning and managing”. In this book we have addressed a wide range of issues covering Planning, Human Resources, Marketing, Sales, New Business and Products and Management. We feel sure that this book will also provide stimulation and learning across a wide range of business issues for people at any level of business. This publication is one of a constantly expanding series, of what we trust are interesting, stimulating, and informative publications addressing a wide range of Business topics and issues. We have written these publications from the perspective of, and with hindsight gained as an experienced, practising manager, working in the real, day to day business world. Our objective has been to provide easy to read and understand information which can be assimilated into, and used in real life, day to day business situations, quickly, easily, and in many instances, with little expense.